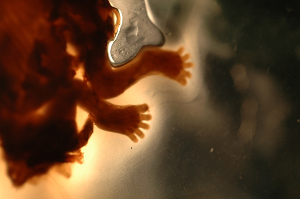 One of the aborted babies found in the trunk of abortionist Michael Roth’s car. 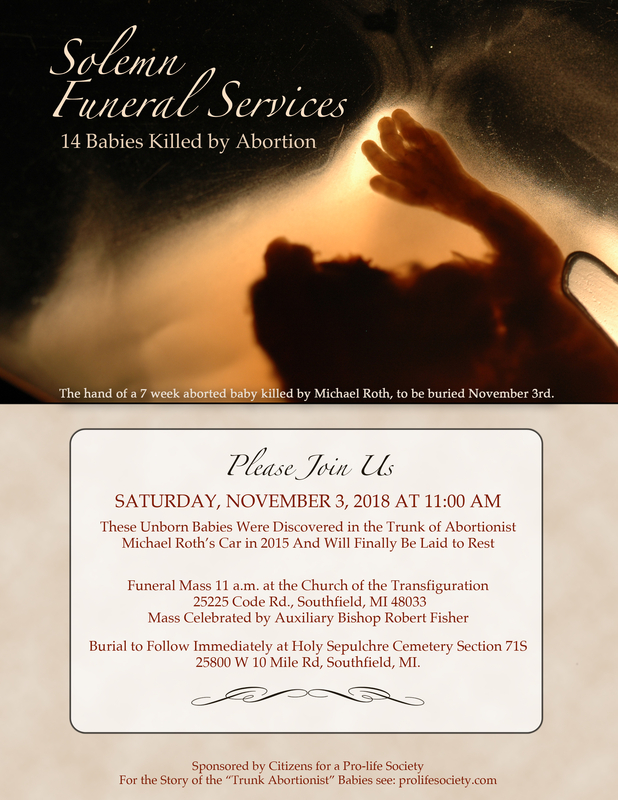 Funeral Mass 11 a.m. celebrated by Archdiocese of Detroit Auxiliary Bishop Gerald Battersby at the Church of the Transfiguration located at 25225 Code Rd., Southfield, MI 48033 Burial to Follow Immediately at Holy Sepulchre Cemetery 25800 W 10 Mile Rd, Southfield, MI. In the next few months Roth attempted to rent other office space to restart his abortion practice. Again activist Lynn Mills, through her investigative skills, was able to discover exactly where Roth intended to relocate. Twice she succeeded in influencing landlords not to rent to abortionist Roth. In the early Winter of 2015 Roth went on to rent office space in Farmington Hills, MI. but it appears his lease did not permit him to do abortions. Mills sent an assistant into the new office location. She tried to secure an abortion appointment and was told Roth was not offering abortions. He would eventually close up this office as well. In September of 2015 Roth was involved in a car accident in his hometown of West Bloomfield where he struck and seriously injured a pedestrian on Orchard Lake Road. As a consequence, Roth’s car was impounded by local law enforcement. Photo. 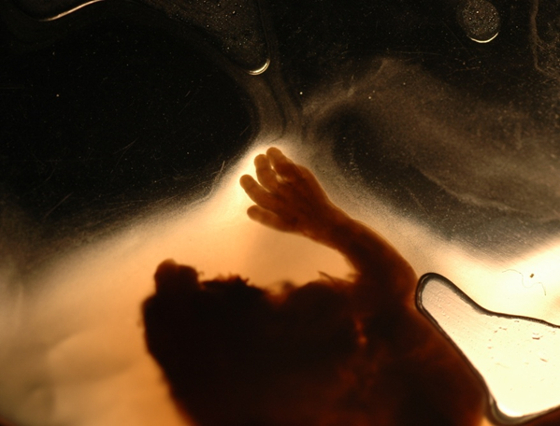 One of the babies found in trunk of abortionist Roth’s car. Due to Lynn Mills notifying landlords that they were about to have an abortionist for a tenant, Roth was an abortionist without a clinic and it appears that he simply began doing abortions in hotel rooms or even in the private homes of his female clients. 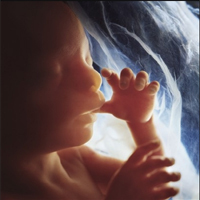 Citizens for a Pro-Life Society knew that the trunk abortionist babies were being held as evidence by the Oakland County Medical Examiner’s office and spent nearly two years in an effort to obtain them for the purposes of a humane burial. Finally, after dozens of phone calls made by CPLS director Monica Migliorino Miller and letters of request, the babies Roth aborted, found in the trunk of his car were given to our pro-life group. Oddly Roth was never charged with doing illegal abortions. Since Roth was a licensed physician the Assistant Attorney General handling the case lacked confidence that they would achieve a conviction regarding Roth’s apparently doing abortions outside of a clinic setting. Six of the fifteen specimen jars containing remains of aborted babies found in the trunk of abortionist Michael Roth car, Sept. 29, 2016.